As always our ladies officer, Sharon Bassindale, arranged for glorious weather for the ladies ride in Forest of Dean. Unfortunately, Sharon was unable to attend – something about acrobatics gone wrong! The job of back marker, I mean ride leader, fell to me. To say I was a bit worried was an understatement – mainly due to my painful previous experiences there. There were 5 of us in total: Jo, Hazel, Clare, Ania & myself. 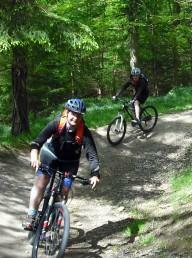 We decided to start with a lap of the Verderers (blue) trail which everyone thoroughly enjoyed. However it transpires that there were some strange ladies on the ride – ones who like cycling up hill. Weird! At the end of the lap, and everyone in one piece, it only seemed right to stop at the cafe & eat cake. After a quick vote, and Jo assuring us that we’d all be able to do the freeminers (red) trail, we set off again. We soon noticed very quickly that it’s quite rooty but everyone handled it very well. The only dubious moment was having to cycle through the branches of a fallen tree. The end of the lap is right by one of the downhill tracks – so we started pushing our bikes up. Following Jo down, we all got to the bottom still on our bikes. The others decided to have another go so I took photos – well I wasn’t going to push my luck as I’d managed to stay on my bike all day. Jo did a “proper” run and it was good to see everyone around stopping to watch her – she makes it look so easy. Unfortunately Ania had to go home after this but those of us remaining went on to complete the family (green) trail – with a few blue off-shoots to play on. Despite the others telling me that the old railway line wasn’t uphill, I could tell it was. But on the upside, if you go up, at some point you get to go back down – making sure we all avoided small children on bikes with little sense of direction. We covered 30km in all and everyone seemed to enjoy the day – which ended up in us eating cake again. Well, it was a ladies ride afterall. Looking forward to the next ride with Sharon back at the helm. Oh and a massive thanks to Jo for passing on tips, taking photos and giving plenty of encouragement (even with a dislocated finger). 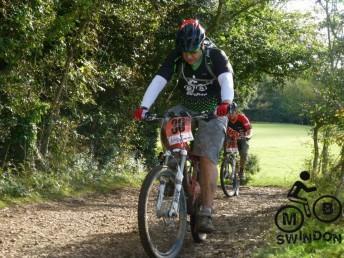 Bristol Bikefest is one of MBSwindon’s big events of the year, a 12-hour team enduro race around the Ashton Court trail in Bristol. While the event does attract some serious teams, it is also a welcoming and friendly event for all levels of rider to try and the club enters a number of teams of varying abilities and fitness so everyone can get a good experience. It is, however, hard to decide whether or not to enter an event such as this when you don’t know what you are letting yourself in for…. Which is where this ‘Recce Ride’ comes in. Simon Oxlade and Jason Rodger are going to go to Ashton Court and take you around the Bikefest track, which is a little different to the signposted trail loop. Along the way we’ll be explaining what comes next on the trail, where the start and finish is, changeovers, how the event runs as well as introducing you to the trickier bits of the track and giving tips on how to ride them. We’ll then do a second loop, this time of the signposted trail (which is easier than the race track) and, if there’s any energy left in the legs, we’ll go for a lap of the Yer Tiz trail in nearby Leigh Woods. All the trails are Blue graded with the exception of part of the Bikefest loop which is Red. Hardpacked gravel surfaces, some mud, some cobblestones, some bare rock and some roots. Three steep, but short climbs, one of which is poorly surfaced. One long fast downhill, which is not technical. 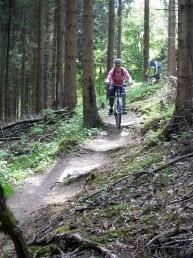 Three shorter downhill sections which are more technical, but are not necessarily fast. Camelback/water bottle, some trail snacks, multitool, puncture repair kit/spare tube, pump, helmet, bike!!! We’ll be meeting at the Ashton Court Golf Course car park, which is accessible from the Gatehouse entry to the estate. From Swindon, take the M4 West, then the M5 South. Get off the M5 at J19 Easton-in-Gordano and take the A369 . When you see the sports fields on your right, you are getting close. Go straight on at the traffic lights and, as you drop down the hill, the gatehouse will appear on your right. Turn through the gate house and follow the road, turning right up the hill to the car park. Alternative scenic route is to go into Bristol and head for Clifton and the Suspension Bridge. Cross the bridge (Toll!) and continue straight on. When the road ends, the Gatehouse is directly in front of you. Any questions, please ask below and on the event’s Facebook page.